My latest book,Falcon Blue, while technically Book Six of the series, can be read right after this boxed set (The Bronze Age segment) without missing a thing! Happy Reading! Gathered together here are the first three books of The Child of the Erinyes series. The Year-god's Daughter, The Thinara King, and In the Moon of Asterion. 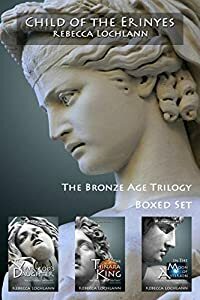 The Bronze Age portion of the eight book series can now be read in a convenient boxed set, and is half the price of buying each book separately. Crete: where magic & mystery meet courage and hope. Aridela: an extraordinary princess who dances with bulls. Two brothers plot Crete's overthrow, but desire for this woman will propel all three into an unimaginable future, and spark the immortal rage of the Erinyes. “Atmospheric, lyrical, and inspired. I envy readers newly discovering this riveting epic.” Lucinda Elliot, author of That Scoundrel Emile Dubois, Ravensdale, and The Villainous Viscount: or The Curse Of The Venns. The set also includes an excerpt from Book Four, The Moon Casts a Spell, Book Six, Falcon Blue, and a teaser for Swimming in the Rainbow, Book Eight. For time beyond memory, Crete has sacrificed its king to ensure good harvests, ward off earthquakes, and please the Goddess. Men compete in brutal trials to win the title of Zagreus, the sacred bull-king, even though winning means they'll die in a year. Hindering their goal is the seductive and fearless Cretan princess, Aridela, an uncommon woman neither brother can resist, and ancient prophecies that promise terrible retribution to any who threaten Goddess Athene's people. The Year-god's Daughter and The Thinara King are both award winners: A B.R.A.G. medallion and a Chaucer First Place Award for Ancient Historical Fiction.